Yes, my new perfect size is 8.5" X 12.5". Small enough that I can try out fun and interesting ideas, and large enough to enable a good amount "stuff" going on. I have painted other small format zebra pieces, but this time wanted to explore a couple of new elements. The first is the brown and furry-looking stripes of a young zebra. 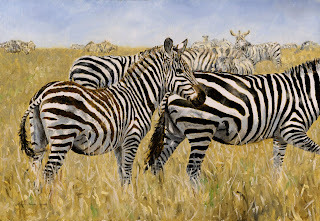 Secondly, I wanted to play with the sense of distance by softening the look of the zebra herd in the background. About a month ago, I remembered reading in a book I have that years ago Bob Kuhn had found the perfect size. I didn’t remember what it was, but knew he used those dimensions for quite a number of his paintings. The paintings were smaller in scale and he liked the format and detail he could put into the composition. Thinking, "why reinvent the wheel," I found the book in which he was quoted. He was talking about this perfect size and how a friend had suggested he paint all the big North American game with these dimensions. "Perfect," I thought. I’d probably want to reduce the size but I could keep the same proportions. Now, all I had to do was find the size in the book. I found it. 14.5" X 18.5". Ick! What a horrible size! Granted Bob Kuhn’s paintings were wonderful, but no matter how many ways I looked at it, the 1:1.28 ratio just didn’t appeal to me. Too square. So, it was time to invent my wheel, my "perfect" size. The first consideration, I wanted it less than one square foot. Secondly, I didn’t want it to be a "standard" size, (8" X 10" or 9" X 12".) After about an hour of calculations, taking boards and looking at them up close and from across the room, I got it. The completed painting, though it hasn’t been varnished. The spray varnish I use (Krylon Kamar) will bring out the richness of the browns and even-out the shine. Since I used a heavy hand with thickness of the paint for the grass, I will wait a bit before I varnish. One change I made from my drawing was the length of the dog’s extended foreleg. My reference might have shown it that way, but it didn’t "look right" to me. I don’t consider my beginning drawing locked in stone (or paint.) It is a guideline, subject to modification. I am looking forward to more dog (and Hersey paintings.) Now that I have a better grasp on the "dog thing", I think it would be fun to do my next dog painting with a dog in water (water being such a fun subject to explore in oil paint.) Stay tuned. Here is the continuation of my chocoate lab painting. I began with the grasses and didn’t want to go too bright or detailed. The focus should stay on the head of the dog and I look at the rest as being incidental. I am a cat person. Always have been. I get teary eyed when I watch cat commercials on TV and a meow will touch my heart like little else. So, it has taken me a while to understand the "dog thing." I like dogs, but they aren’t cats. However, something happened when my husband got a girlfriend. Her name is Hersey and she is a chocolate lab. I began to understand that unique connection between a man and his dog. And, more succinctly, between a man and his hunting dog. Hersey and my husband have been best buddies since she came home with my neighbor as a pound puppy about 3 1/2 years ago. 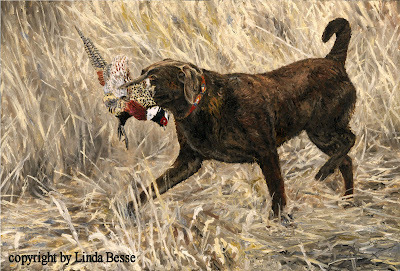 Wanting to see this relationship in action, I had the opportunity to go pheasant hunting with my husband and "his" dog. It was fascinating watching them work together. Hersey’s heart and nose rival the best hunting dogs. 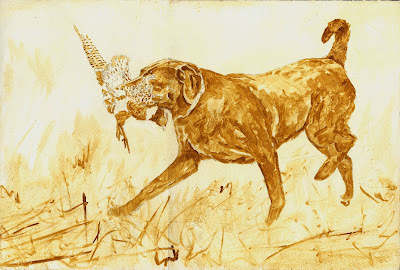 Her movements exact when she flushes, her drive to the downed bird impressive, and her joy in the retrieval - infectious. Below is the start of the painting, The Retrieve. This is my underpainting, a turpentine wash of burnt sienna and raw sienna. 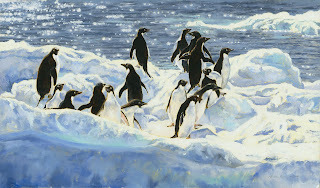 Two of my paintings, Penguin Party and Last Light have been accepted into the Society of Animal Artists Small Works - Big Impressions show at The Wildlife Experience in Parker, CO. The show will run from November 7th, 2009 - January 3rd, 2010, and every piece in the show is available for purchase. Original oil - 8" X 13.75"